Anthony Bainbridge from CrossFit Fredericton debriefs us from New Brunswick. Anthony Bainbridge from CrossFit Fredericton checked in with a debrief of the weekend in New Brunswick. Clean and Jerk PRs were broken in nearly every heat. The athletes and organizers at the East Canada Sectional finished the first day strong. 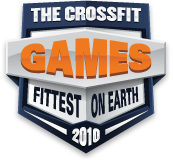 Anthony & Jodi Bainbridge of CrossFit Frederiction check in with the following report.